Carry on Camping – Is this Britain’s oldest caravanner? 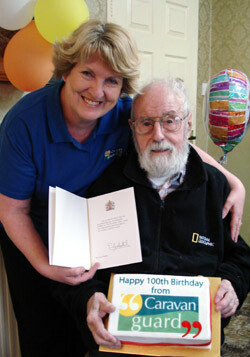 Possibly the oldest active touring caravanner in Britain has turned 100. John Hartley celebrated his 100th birthday on the 24th November. Born in Liverpool but now living near Chester, he is still very much full of life and enjoys touring the country with his daughter Margaret, who herself is now over 70 years old. Active John goes for a long walk everyday when at home, enjoys the countryside when he travels with his tourer and even planted the tree given to him as a present for his 100th Birthday. Most would see receiving their 100th Birthday telegram from the Queen as a sign to slow down, but not John, who says he’ll carry on regardless with his outdoor lifestyle. John’s done his fair share of travelling during his lifetime and has flown to various exotic destinations around the world, but still says that caravanning is his favourite past time with Scotland being his favourite touring location. 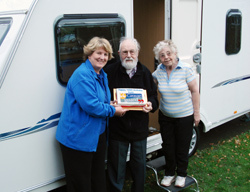 We have no upper age limit on our tourer caravan insurance policy. We offer extensive cover with great discounts – including 10% off for caravanners over 30 years of age!